Not Really A Door (Live Theater): Fridays at 7pm at the Crescent Hotel. A one hour, two-woman, jam-packed, keep-em-guessing, supernatural murder-mystery comedy-thriller. Performed in America’s Most Haunted Hotel, it runs 60 minutes with no intermission. Recommeded for ages 12+ SPECIAL OFFER! $15 Per Person. Buy Tickets. Flickering Tales (Live Theater): Fridays & Saturdays at 11pm at the Crescent Hotel. Huddle around a fire at America’s Most Haunted Hotel, the 1886 Crescent Hotel, to hear Ozark stories of witches, monsters and ghosts. Made even more thrilling with a Midnight visit to Eureka’s most haunted site, the Crescent Hotel Morgue. 60 minutes. $12 per person. Buy Tickets. Spirits of the Basin Tour: Tuesday-Sunday at 8pm at the Basin Park Hotel. Explore the legendary Basin Park Hotel, from the Crow’s Nest to the underground cave, and experience the spirits – living, dead and 92 proof. 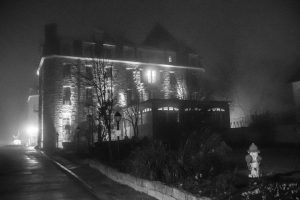 The tour presents the history of Early Eureka Springs and includes a guided ghost hunt of the most haunted spaces and ends with a chilling ghost story told by candlelight while surrounded by the limestone bluff. $18 Per Person. Buy Tickets. Crescent Ghost Tour: Tours Nightly at 8pm. America’s Most Haunted Hotel where some guests checked out…but never left. The Crescent has been featured on popular shows like Ghost Hunter’s and Bio Channel’s My Ghost Story. Tours gain exclusive access to some of the most famous ghost sighting locations and into the morgue. $22.50 per person. Buy Tickets. Anna: A Haunting Theatrical Experience (Live Theater): Th, F, Sat, M 7pm, 8pm, & 9pm THE STORY ANNA: a haunting theatrical experience has become a Halloween staple in Eureka Springs. We invite you to step inside Crowe Manor and back in time to 1940. Meet James and Annabelle Crowe and keenly observe as their frightening secrets are revealed. Listen for the whispers in the walls, and doubt not if you think you’ve seen a ghost. The roots run deep and the blood is real. You may make it out alive, but will you go crazy? “Wow & wow. What an experience!” $20 per person. Buy Tickets. Downtown N Underground Tour (Walking Tour): W, Th, F, Sat, & Sun at 4PM. 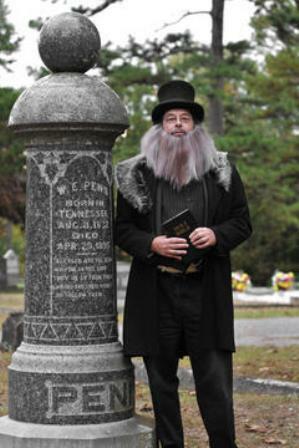 (Sat offered 2pm & 4pm) Take a brave step into Eureka Springs unexplained underground. Discover buildings that lie under the streets and see the city in a way that even local residents haven’t seen! 75 minutes. $13.50 per person . Buy Tickets. Intrigue Theater (Illusion Show): W, Th, F & Sat at 8pm This Exclusive experience is limited to less than 24 people seated in the round as Sean-Paul, the Illusionist, entertains with close-up Sleight-of-hand and Mentalism. Surprises and paranormal demonstrations can also be expected. $24.95 per person. Buy Tickets. Haunted Eureka Tours (Driving Tour): Sun-Fri at 8pm Take a guided shuttle bus tour of one of the most haunted towns in the United States! 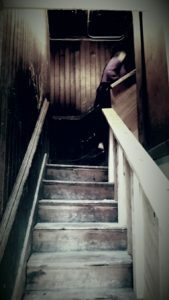 Learn to use ancient and modern ghost hunting tools while going on property at various “active” sites along the route. See parts of town most tourists don’t know exists and learn about our fascinating and haunted history. $24.50 per person . Buy Tickets. Escape Room 13: Sun-Th 10am-10pm An immersive live action adventure that puts you in the story. Can you prove someone’s innocence in one hour? $25 per person. Buy Tickets. 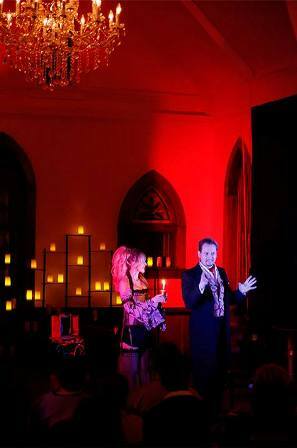 Halloween Seance with Intrigue Theater: 10/31 at 6pm On Halloween, the stars of Eureka Springs’ Intrigue Theater, Sean-Paul and Juliana Fay, will be returning to the Crescent Hotel’s Crystal Ballroom for one late night dinner show. This year they will astound their audience with paranormal experiments between courses. Then following dessert, patrons will witness a seance in an effort to reach some who have “crossed over.” This ticketed event is open to hotel guests and visitors. $65 per person. Buy Tickets.